Despite vowing to stay indoors for two days and do nothing but eat, drink, read and be generally indulgent, I was persuaded to get off my backside today for a Boxing Day walk. Typically, the skies have been leaden since Christmas Eve and yesterday it rained pretty much all day. Yet whilst we languish indoors, snoozing in front of the television, there are still a handful of plants that are working hard through the festive season. 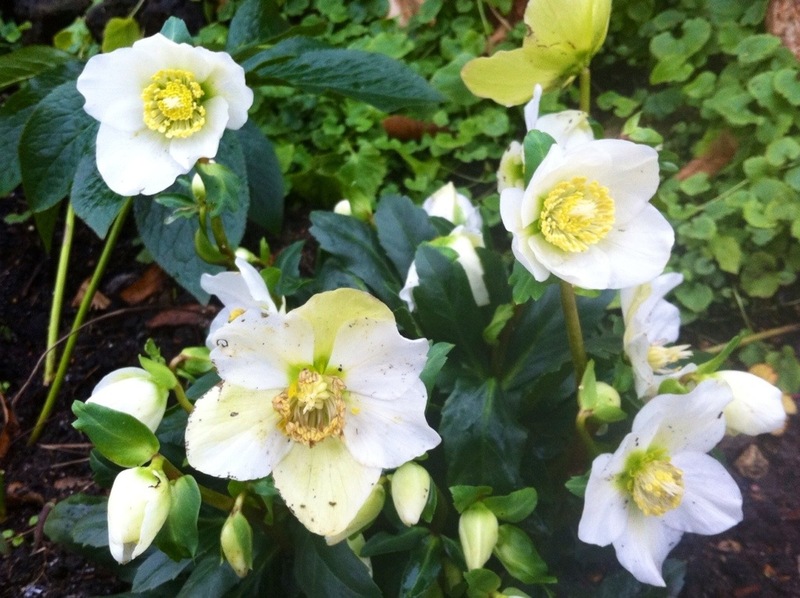 In the front gardens of the mansion blocks of Hampstead, cheerful Christmas roses (Helleborus niger) shine out of the gloom. Helleborus niger is known as the Christmas rose because of a legend that it sprouted in the snow from the tears of a young girl who had no gift to give the baby Jesus in Bethlehem. In the English Middle Ages, people strewed the flowers on the floors of their homes to drive out evil influences. In reality they have nothing to do with actual roses and can be difficult plants to grow. Moist, humus-rich, alkaline soil in light shade is preferable, although leaf-mould can be added to improve heavy clay or light, sandy soils. It’s also a good idea to position Christmas roses so that soil isn’t splashed onto the petals, which are borne very low to the ground. Picking up the sunny yellow of the hellebore’s central boss was winter jasmine (Jasminum nudiflorum). Whilst not a true climber, this scrambling plant is essential for any winter garden. Sadly, unlike other jasmines, it carries no scent and has a rather messy habit, but for colour at Christmas-time it’s hard to beat. 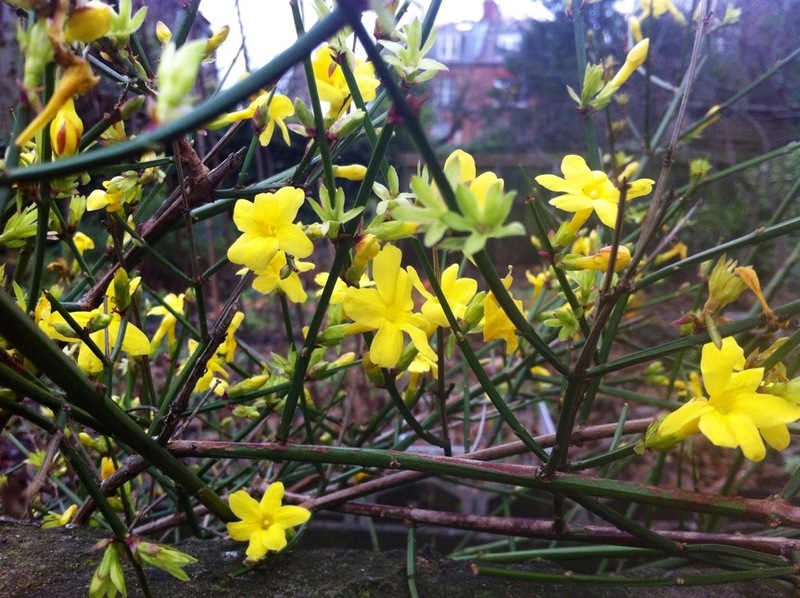 Winter jasmine isn’t fussy about soil type or situation, so makes a pretty safe bet for covering shady walls and fences in unpromising situations. 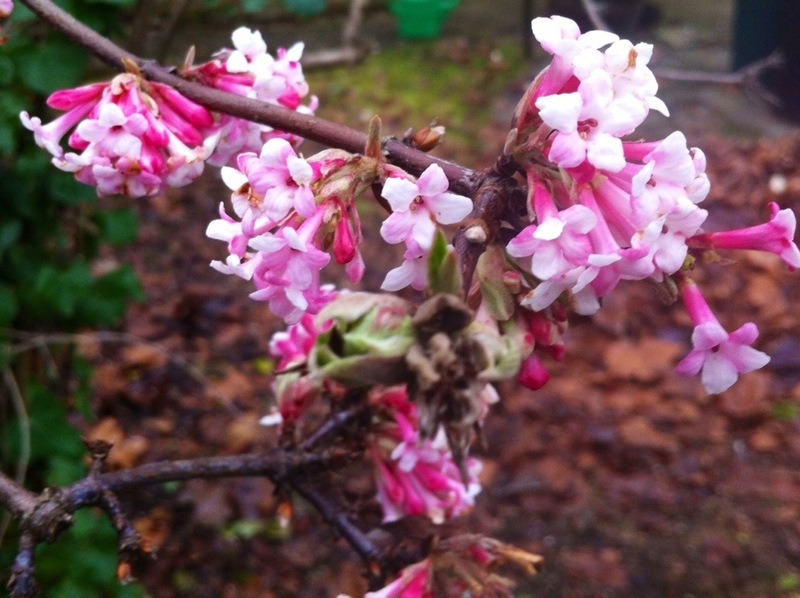 Winter flowering viburnums such as Viburnum x bodnatense ‘Dawn’ (above) are reliable Christmas flowerers, their tender pink blossoms appearing on long bare stems. As a shrub Viburnum x bodnatense can be very upright and awkward, so position against a wall or towards the back of a border, but somewhere you will still be able to appreciate the wonderful scent. If you’re not fussed about fragrance, the delicate frame of flowering cherry Prunus x subhirtella ‘Autumnalis’ is much prettier, especially with it’s tissue-like flowers displayed against a pale blue winter sky. For winter berries, there’s so much choice amongst the hollies, cotoneasters and Berberis. For something a little out of the ordinary, Nandina domestica (Heavenly Bamboo) makes a lovely small shrub, carrying panicles of white flowers followed by tiny red berries. However watch out if you have pets or wild animals in your garden as the berries are toxic. The young leaves in spring are brightly coloured pink to red before turning green; old leaves turn red or purple again before falling. Here in London, where it’s been a mild winter so far, the leaves are still holding fast. 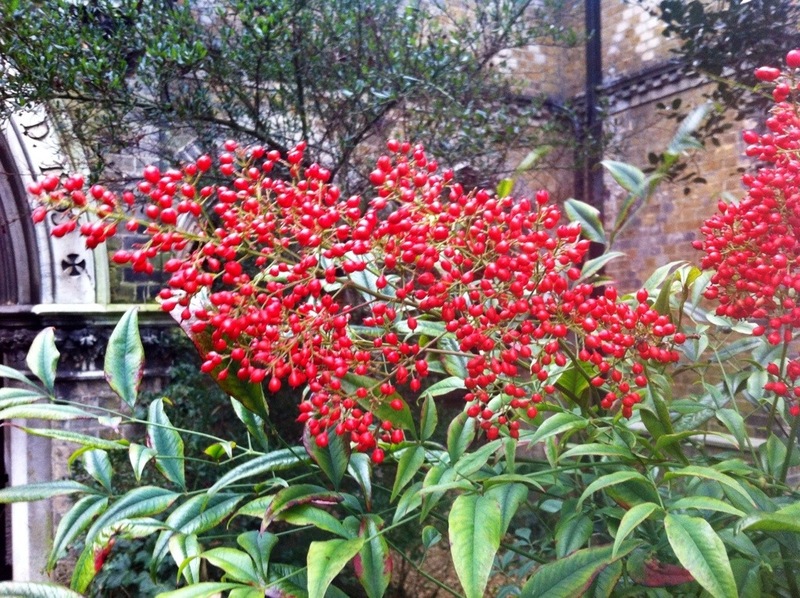 Below, Nandina flourishes at the entrance to Holly Village, an enclave of eight Victorian Gothic houses in Highgate. None of these plants are particularly rare, but all guarantee a bright flash of colour at an otherwise drab time of year. And that’s a precious thing. We returned home as the rain set in again and are now firmly installed on the sofa. Now where’s that book?